I was asked to make a Nursery Rhyme Cake as a 1st birthday party cake and came up with this idea. 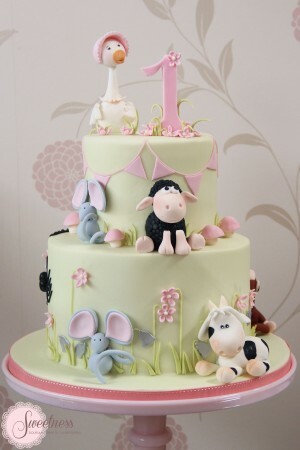 This nursery rhyme cake revolves around a garden theme and incorporates the animals in various nursery rhymes. The idea was that people would eventually guess that it’s a nursery rhyme cake with the sugar modelled animals acting as clues. 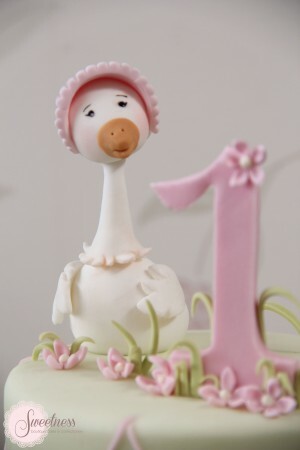 You have the three blind mice, the cow that jumped over the moon, silver bells, the spider, black sheep and of course no nursery rhyme cake would be complete without mother goose! 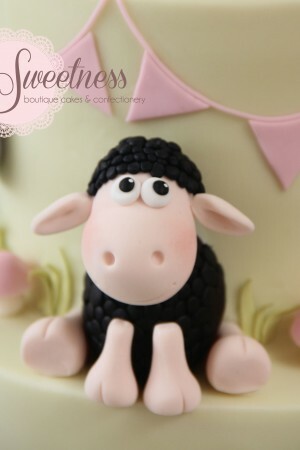 I hope you all like my take on a nursery rhyme cake! Please visit our children’s cakes and party cakes pages to have a look at some of our other cake designs. Children are fans of pirates and mermaids. 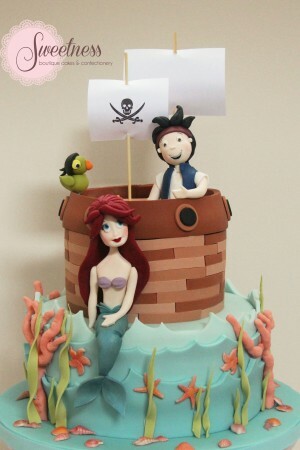 I was asked to make a Pirate and Mermaid cake for a brother and sister’s birthday party and came up with this design. The top tier is the pirate cake with a pretty happy looking pirate at the top complete with his trusty parrot sidekick. I decided to make masts to complete the look and give the cake some height. 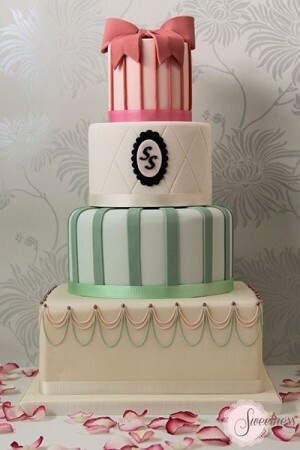 The bottom tier is the mermaid cake. I wanted to create a wave effect with this tier and think the graduated fondant helps do that. The mermaid’s face was a hit at the party as I wanted her to look pretty but also looking up at the pirate as if they were pals. I hope you all like the cake! 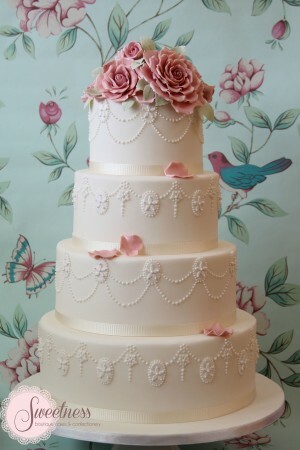 Sweetness offers bespoke party cakes in London and Greater London. 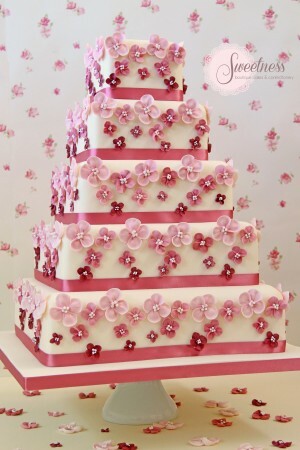 Sweetness Cake Boutique Shortlisted in the Cake Designer category of the Hitched Breakthrough Awards 2013!!! 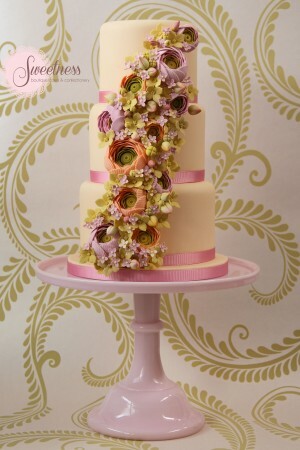 Exciting news this week – we have found out that we have been shortlisted in the Cake Designer category for the Hitched Breakthrough Awards 2013! I’d like to take this opportunity to thank everyone who supported me when I decided to follow my dream of running my very own cake boutique. It’s been an amazing ride so far from meeting lots of lovely fellow cake makers and clients, cake and set up challenges and not to mention the joy of putting on my chef whites in the morning and cracking on with what I love doing best! I love doing baby showers! The mum and dad to be are always so over the moon it’s such a joyous thing to be a part of. Baby shower cookies and cupcakes are a great addition to any baby shower and guests can help themselves to an individual treat whenever they fancy a nibble. 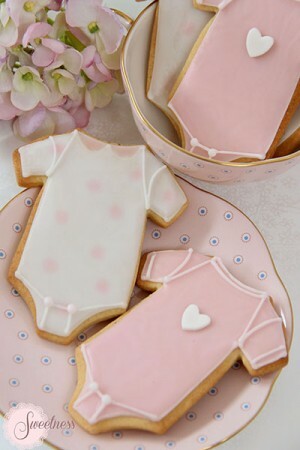 Sweetness Cake Boutique London offer a range of iced cookies for baby showers. We can make them in any shape and size you desire and theme them for your particular baby shower. We currently offer Vanilla and Lemon cookies but are happy to make other flavours to suit your needs. 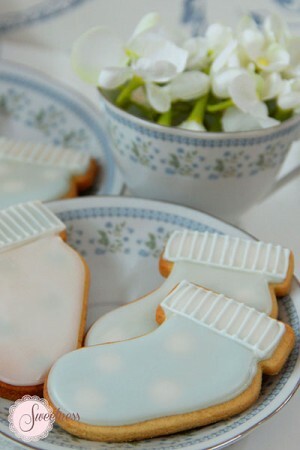 We have a cookie favour service where cookies can be individually wrapped to give out to your guests on the day. 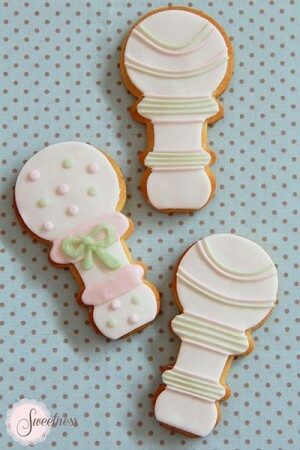 We hope you visit our Baby cakes and confectionery page for baby shower inspiration. We currently offer baby shower cakes, cookies, fondant fancies and cupcakes for the London and Greater London area. Please contact us with any enquiries.